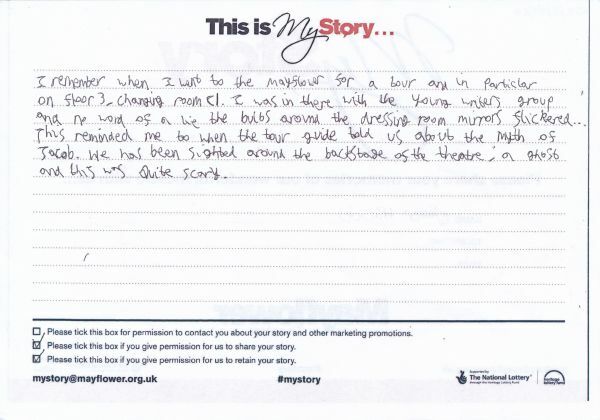 My Story card: Oliver Hiscocks remembers the lights flickering in the dressing rooms on a backstage tour. I remember when I went to the Mayflower for a tour and in particlar on floor 3 - changing room C1. I was in there with the young writers group and no word of a lie the bulbs around the dressing room mirrors flickered… This reminded me to when the tour guide told us about the myth of Jacob. He has been sighted around the backstage of the theatre, a ghost and this was quite scary.